It is autumn in Amsterdam. The woman is Hye-young (starring Jeon Ji-hyun), a young Korean artist who paints portraits in the city square, while dreaming of one day holding a solo exhibition of her works. She is a stranger in this city, and Hye-young’s only source of strength is the memory of her first love. Then she meets a new man - well, almost meets him, she never really sees his face but after giving him a drawing of a daisy, he responds by having a pot of daisies delivered to her door every day. Could this be the start of a new love for the lonely young artist? A t the same time, however, a second man enters Hye-young’s life, a stranger who keeps coming to her, asking her to draw his portrait. That man she has been drawing is Jung-woo (starring Lee Sung-jae), an international agent based in Amsterdam, He first approached Hye-young, while in the line of duty, but was immediately mesmerized by her charms and beauty. She quickly assumed that he was the one giving her daisies and begins to fall for him. Jung-woo knows that he is not the one in Hye-young’s heart, but he feels he must remain quiet about the truth or lose her love forever. Finally, destiny brings all of their paths together, when Yi gets his next assignment for assassination - and discovers it is Jung-woo. A European destination rarely provides the backdrop for an Asian film. Unless you count the many Bollywood movies that have been filmed around the world, from New York to London to Amsterdam to even Singapore. However, now comes, Daisy, a joint Korean-Hong Kong production set fully against the beautiful backdrop that is Amsterdam. At this stage, please remove all thoughts about the farce, Deuce Bigalow: European Gigolo. Infernal Affairs, a film about triads and undercover cops which took the world by storm, is currently being remade by Hollywood as The Departed. Starring A-listers like Leonardo DiCaprio, Matt Damon and Jack Nicholson, it is clear the influence Infernal Affairs has had on the world. It is no doubt then that Hong Kong director, Andrew Lau, is the right man for Daisy. Jeon Ji-Hyun (My Sassy Girl) plays Hye-Young, an artist who paints portraits in the city square. Park-Yi played by Jung Woo-Sung is a contract assassin enamoured by Hye-Young and leaves daisies at her door, at the same time everyday. The love triangle comes in when Jung-Woo played by Lee Sung-Jae, an Interpol agent meets Hye-Young at the city square. He falls for her and soon, she assumes that he is her secret admirer. The film picks up early-on when Park-Yi realizes that Hye-Young had fallen for the wrong guy. He keeps a close watch on the two, always pondering how he could convince Hye-Young that he is the one. 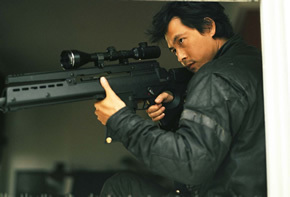 A heated shoot-out occurs in the city square with the public, Park-Yi, Jung-Woo and gang members are involved in crossfire. This sets the motion for the next half of the film which is bound to keep you on the edge of your seat. Action fans will be disappointed that the shooting does not occur throughout the whole film. But rest assured, when the action sequences come your way, they are way intense and slightly bloody. Like the assassin and the Interpol agent, the pacing of the action sequences are slick and smooth. In Daisy, the music used is so subtle and stirring that many will fail to realize it. Like a game of football, it becomes the twelfth player on your team, to give you that added boost. The various pulls on the strings of the violin slowly tugs at the strings of your heart just like a Korean soap opera would. And amidst the ashen demeanour of the story, the film itself is a resplendent one. Just like the titular flower, the film is driven by its subtlety and many quiet moments.